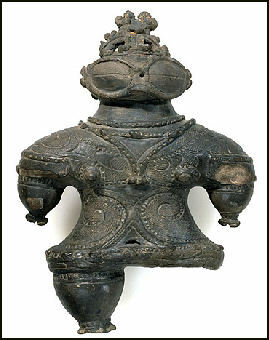 Dogu, a Jomon clay figure The period of Japanese history between 10,500 and 400 B.C. is referred to as the Jomon Period. The people who lived at this time are regarded as Japan’s first major culture. They were among the first people to make fired pottery. Jomon is the name of the cord markings on the pottery found in this period. Some Jomon were seafarers who built boats out of sewn planks of wood, practiced deep-water fishing and perhaps island hopped all the way to North America. Jomon culture first arose in Japan at least 12,000 years ago and perhaps as early as 16,000 years ago, when the islands of Japan were still connected to the Asian mainland. Jomon people showed up at the end of the last ice age and appeared to have lived in isolation and had little contact with the people on the Asian mainland. Many scholars believe that the Jomon people were Ainu, a people who practiced a religion centered around blood-sacrifice and bear rituals and who survive today in small numbers in northern Japan. [See the People-Minorities section for more information about the Ainu]. Places where prehistoric people live are often indicated by the presence of middens, heaps of discarded shells. Many have been found in the Tokyo area. The oldest Jomon Period remains were found in Chino in Nagano Prefecture. One of the largest Jomon sites is in Kasori, now part of Chiba city, near Tokyo. It boasts a large shell midden and was discovered by an American Edward Moss. It is now a preserved site with a constructed village open to tourists. There are several tunnels with glass walls that cut right into the shell midden. Jomon and Yayoi Sites Aileen Kawagoe, Heritage of Japan website, heritageofjapan.wordpress.com; Charles T. Keally, Professor of Archaeology and Anthropology (retired), Sophia University, Tokyo, t-net.ne.jp/~keally/jomon. ; Metropolitan Museum of Art Department of Asian Art. "Jomon Culture (ca. 10,500–ca. 300 B.C. )", Heilbrunn Timeline of Art History, October 2002, metmuseum.orgWikipedia article on the Jomon Wikipedia ; Dogu Exhibition at the British Museum britishmuseum.org ; Back to the Future furutasigaku. . Historical Parks Sannai Maruyama Jomon Site in Northern Honshu sannaimaruyama.pref.aomori.jp ; Yoshinogari Historical Park (between Tosu and Saga on the JR Nagasaki line south of Fukuoka) is an interesting historical park that brings to life the Yayoi Period (400 B.C. to A.D. 300). Website: yoshinogari.jp/en ;Good Photos of Jomon, Yayoi and Kofun Sites at Japan-Photo Archive japan-photo.de ; Prehistoric Archaeology of Japan” dil2.sakura.ne.jp is the Niigata Prefectural Museum of History website. It has pages on shell middens; plant exploitation and “Jomon subsistence“. Books Useful references in English on the Jomon Period: 1) Akazawa, Takeru. (1980). Fishing Adaptation of Prehistoric Hunter-gatherers at the Nittano Site, Japan. Journal of Archaeological Science, 7:325-344. 2) Akazawa, Takeru, and C. Melvin Aikens, eds. (1986). Prehistoric Hunter-gatherers in Japan -- New Research Methods. Bulletin no. 27. Tokyo: The University Museum, The University of Tokyo. 3) Habu, Junko. (2004). Ancient Jomon of Japan. Cambridge, England: Cambridge University Press. 4) Keally, Charles T., Yasuhiro Taniguchi and Yaroslav V. Kuzmin. (2003). Understanding the Beginnings of Pottery Technology in Japan and Neighboring East Asia. The Review of Archaeology, 24(2): 3-14. 5) Keally, Charles T., Yasuhiro Taniguchi, Yaroslav V. Kuzmin and Igor Y. Shewkomud. (2004). Chronology of the Beginning of Pottery Manufacture in East Asia. Radiocarbon, 46: 345-351. 6) Kidder, J. Edward, Jr. (1968). Prehistoric Japanese Arts: Jomon Pottery. Tokyo & New York: Kodansha International. 7) Kikuchi, Makoto. (1997). Shimosa Daichi Tokyo Wangan Chiiki ni okeru Jomon Jidai no Iseki Ritchi (Location of the Jomon Sites of the Shimosa Upland along Tokyo Bay). Busshitsu Bunka (Material Culture), no. 62, pp. 34-48. (Busshitsu Bunka, Hakubutsukangaku Kenkyu-shitsu-nai, Rikkyo University, Nishi Ikebukuro 3-chome, Toshima-ku, Tokyo 171-0021, Japan). 8) Kobayashi, Tatsuo. (2004). Jomon Reflections: Forager Life and Culture in the Prehistoric Japanese Archipelago. Ed. Simon Kaner and Oki Nakamura. Oxford, England: Oxbow Books. 9) Koyama, Shuzo. (1978). Jomon Subsistence and Population. Senri Ethnological Studies, vol. 2, pp. 1-65. (National Museum of Ethnology, Senri Expo Park, Suita, Osaka, Japan). 10) Koyama, Shuzo, and David Hurst Thomas, eds. (1981). The Affluent Foragers: Pacific Coasts East and West. Senri Ethnological Studies, vol. 9. (National Museum of Ethnology, Senri Expo Park, Suita, Osaka, Japan). 11) “Prehistoric Japan: New perspectives on insular East Asia” by Keiji Imamura. You can help this site a little by ordering your Amazon books through this link: Amazon.com. For more detailed information on Jomon dating see: 1) Jomon Dates by Regions (2006); 2) Jomon and Yayoi Dates in Aomori Prefecture (2000); 3) Middle Jomon Dates in Kanto (1999). And for discussion of some of the problems in Jomon dating see: 1) "Fakery" at the Beginning, the Ending and the Middle of the Jomon Period (2004) (PDF file of Japanese translation); 2) Bad Science and the Distortion of History: Radiocarbon Dating in Japanese Archaeology (last revised: May 14, 2004); 3) The First Radiocarbon Dates for Japan (last revised: April 14, 2004). The Jomon people were originally dismissed as primitive hunter gathers. They made pottery, yes, but without a potters wheel; and they had no agriculture, domesticated animals or metal-working---all of which had existed in China at least by 1300 B.C. One of the main reasons for the lack of development of Jomon people was the fact that Japan was separated by water from more advanced cultures in China and elsewhere in Asia. Recent findings indicate that the Jomon people were much more advanced that previously thought. The discovery of six enormous holes with the remains of one-meter-thick wooden pillars inside at a Jomon site indicates that the Jomon people built large, sophisticated structures. Possessing the technology and the social organization to move and raise large pillars has traditionally been regarded as beyond the means of hunter-gatherer societies. There are cases of dugout canoes dating back to the Jomon (ca 10,000 B.C.-ca 300 B.C.) and Yayoi (ca 300 B.C.-ca 300 A.D.) periods being discovered in Japan. A closer look at the Jomon people has also reveled they had separate cemeteries for children and adults and dabbled with agriculture, planting millet, other grains and chestnuts. Paw prints found around 3,000-year-old Jomon dwelling found near Otsu in Shiga prefecture indicate the Jomon people kept dogs. There is also evidence of slash and burn agriculture dated to 6,000 years ago and hut dwellings with thatched roofs dated to 10,000 years ago. Scientists now think that some technologies and culture’such as buckwheat farming, lacquerware-making---thought to have been introduced to Japan from Korea and China may have actually traveled the other way: from Japan to the Asian mainland. In Ehime Prefecture a pile of stones in the Inland Sea once thought to be a natural formation is now believed by some to have been made by an ancient people when it was discovered that rays of sunlight pierce a hole between the rocks during the spring and autumn equinoxes. Image Sources: Wikimedia Commons; Jomon clay figures, Tokyo National Museum; National Museum of Science, Tokyo kahaku.go; Jomon Archaeological Sites in Hokkaido and Northern Tohoku jomon-japan.jp. Text Sources: Aileen Kawagoe, Heritage of Japan website, heritageofjapan.wordpress.com <^>; Charles T. Keally, Professor of Archaeology and Anthropology (retired), Sophia University, Tokyo, figal-sensei.org *~*; Asia for Educators Columbia University, Primary Sources with DBQs, afe.easia.columbia.edu ; Ministry of Foreign Affairs, Japan; Library of Congress; Japan National Tourist Organization (JNTO); New York Times; Washington Post; Los Angeles Times; Daily Yomiuri; Japan News; Times of London; National Geographic; The New Yorker; Time, Newsweek, Reuters; Associated Press; Lonely Planet Guides; Compton’s Encyclopedia and various books and other publications. Many sources are cited at the end of the facts for which they are used.